Anna and Donald Womack met in college in orchestra class and have been making beautiful music together ever since. Today, Anna is a viola player and Don is a composer. Their sons, Max, 5, left, and Reid, 8, are carrying on the family tradition on violin and cello. Hearing the story of Anna and Donald Womack, the thought arises that their union was written in the stars. Not necessarily in the flowery, romantic sense, though when they recollect their life, there are shared warm glances and a quiet pride in each other. Rather, there's a sense of destiny in the story itself, of two lives that bear such uncanny similarity, their union seems a foregone conclusion, a cosmic eventuality. Theirs is a rare harmony, and it's fitting, since Anna and Don make their living making music and are passing on that common bond to their two young boys. Don, a professor and acting chairman of the University of Hawaii's Music Department, is a composer. Anna plays viola for the Honolulu Symphony. 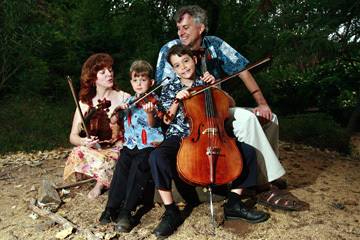 Their sons, Reid, 8, and Max, 5, are studying cello and violin, respectively. While the couple's work might sound highbrow, with careers entrenched in "serious" classical music, their family's daily routines and challenges are no different than anyone else's. "It's like tag team," Anna says with a chuckle. "When Don comes home from work, I leave for rehearsal. Or, acting chair and all that, I drop the boys off at his office." But unlike careers in other fields, employment opportunities in music can be few and far between. When the Womacks moved to Hawaii in 1994, away from their Southern roots, Don had landed -- "landed" being a most appropriate description -- a job at UH. "I was lucky to get a position," he says. "Every year, 200 to 300 composition doctorates apply for 20 or 30 jobs. It's not easy." Anna made tough choices to keep her foot in the professional music world. After four years as a part-timer at the symphony, she was finally offered a full-time position in 1998, several weeks before Reid was born. Neither regrets the choices made. "Sharing something like music is personal and can bring you together," Anna says, and Don nods in agreement. 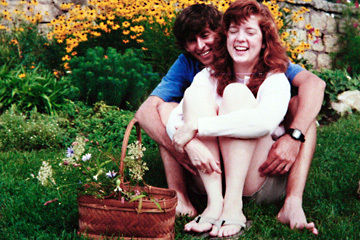 The Womacks as newlyweds in 1990. BEFORE Don and Anna ever met, they were leading parallel lives in the South, Anna in Rome, Ga., and Don in Kingsport, Tenn.
"There was always music in our house," Anna says of her childhood. Anna's mother was a pianist and piano teacher, Anna's sister studied piano and voice, and though their father wasn't formally trained, "everyone in his family was a natural singer. We all sang in church, things like that." Anna's first lessons in music were from her mother, at the piano at age 5. In the third grade, she took up violin. Anna and her sister were continuing a family tradition of musical study: "My violin teacher was Mom's piano teacher when she was a child." By the time Anna was in high school, she was part of the all-state orchestra and Atlanta Youth Symphony playing violin. Her father would drive her 75 miles for lessons and symphony practice. Don, meanwhile, was raised by a mother who loved performing. She wore many hats: musician, actor and director, while his father was a businessman. Like his two older sisters, Don learned piano. In the sixth grade, he began bass, continuing through high school only upon the insistence of his mother. Rather, his foremost interest was cross-country running, a passion he took with him when he entered Furman University in South Carolina. Sophomore year was pivotal in determining Don's path. It was the year he met Anna, a freshman, in orchestra class. It was also when he realized he wanted to study music. "I loved writing and creating, making music that way. It was a way to be a rock star -- not on stage playing, but writing the stuff," he says. Anna took longer to warm up to the idea of a music career. "I didn't think I had it in me to do all that practicing," she says. Yet as an undergraduate, she displayed exceptional abilities as concertmaster of the college orchestra and in her study of viola. 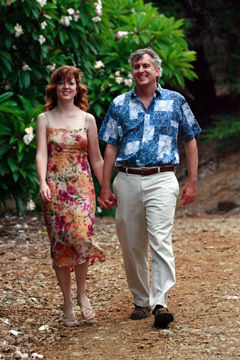 Don and Anna graduated together in 1989 with degrees in philosophy; Don double majored in music theory. Two weeks later they married in Furman's Japanese garden, "not far from the music building," Don recalls with a grin. As newlyweds, Don worked toward a master's degree while Anna worked in the music school's office and pursued a master's in viola performance. In a few years, Don earned his doctorate in composition, and Anna her master's degree. Anna got work with an orchestra in Louisiana -- "I couldn't believe how lucky I was to play in an orchestra!" -- and Don began applying for a university job. Nine months later they were headed for Hawaii. "That was a great time," Don says, smiling warmly at Anna. "We were young and free, doing what we loved, falling in love." "Sharing something like music is personal and can bring you together," says Anna Womack. She and her husband, Don, have successful careers in music. TODAY, the Womacks are still doing what they love, albeit with a dose of practicality. Don's work as chairman of UH's Music Department keeps him desk-bound rather than at the piano composing, and he seems a bit encumbered by the position. "I'm finding that the higher up the administrative chain you go, the less the job has to do with music," he says wistfully. But it was a given that to work in his field, Don would need to be at a university. "The modern patron of composers is the university system. Only a handful can make money composing, unless they write pop music or something like that. So composers (of classical music) have to have 'real' jobs. "But every job has its goods and bads," he says. "Getting to write music for a living is incredible." Don's list of compositions is extensive. In 20 years he has composed some 60 pieces for orchestra, choral, symphony, vocal and solo performance. This summer, his works will be performed in Taiwan, China, Italy and Honolulu. One of his latest, a piece for shakuhachi, koto and shamisen, will be performed in Japan next month. Don will attend. Anna's work also allows her to travel from time to time. In September she will fly to the Big Island to perform with a chamber music group; she belongs to several in addition to her work at the symphony. Anna says her fantasy job would be to play in a string quartet that travels the globe. THE WOMACK household is filled with music. Jazz and classical music play through the day and on into bedtime. And each and every day, Reid and Max bring out their cello and violin for practice. Both boys started playing at age 4. Family outings include concerts. Yet the intent is not to grow professional musicians. "It's a lifestyle," Don says. "With some families it's sports. With us it's music." Reid and Max study music under the Suzuki method, which involves parents in their children's practice. "We don't practice for long, but we do play every day with the kids," Anna says. "Sometimes it's a chore, but occasionally, for fleeting moments, there's a special closeness. It's said that Suzuki parents have good relationships with their children." Music lovers like to tout how music promotes brain development, math skills, communication skills -- the list goes on and on. But for the Womacks, character development matters most. Learning an instrument, they say, cultivates discipline, consistency and a sense of accomplishment. "We've seen Reid progress. Playing the cello has given him confidence," Don says. "He complains, but then he wants to take his instrument to school and play for the class. He's proud." IN THEIR individual and collective lives, Anna and Don have found music to be the tie that binds, at home, at work and at play. Both Anna's sister and Don's oldest sister built successful careers in music. And Anna calls her music friends "the very best friends to have. Sharing music is a bonding thing; you automatically have something in common." It's these opportunities for happiness, embedded in the musical notes on a page, that the couple hopes to pass on to their boys. "We want them to grow up loving music," Anna says. "Music enriches life so much."